How can anyone say this Chocolate Lab Dog is not cool as he patiently waits on the back of a Harley Davidson motorcycle ready to enjoy some highway riding. The cool glasses are to protect the dog's eyes as he spends his days riding free in the warm summer climate of Halifax, Nova Scotia. 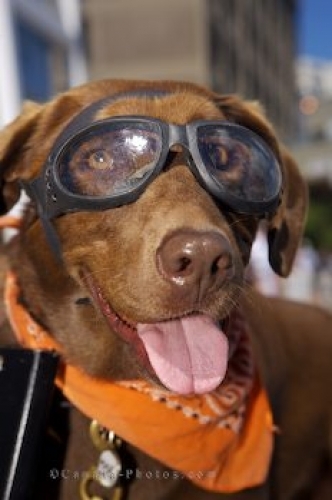 Picture of a cool Chocolate Lab dog ready for a day of riding on the back of a motorcycle.